Students are popping Adderall® pills to get a "focus" edge, but the consequences can be deadly. Harvard Researcher and Brain Institute Director identifies a safer natural alternative to boost students' GPA - the GungHo Focus Shot. There’s a growing epidemic across college and even high-school campuses. Students are popping pills to get an edge, but the consequences can be deadly. A study in the journal, Addiction, found that one in four college students abused Adderall® – a drug prescribed to treat Narcolepsy and ADHD – using it without a prescription. “It’s pretty common. I know people that use it to cram for a test or stay up late. It helps people focus for a couple of hours," said Katie Savercool, a college senior. In 2005, Shire Pharmaceuticals, the creator of Adderall, reported 20 sudden deaths from the use of its extended version of the drug: Adderall XR. Most of the victims had undetected heart conditions. There is clear danger in taking these drugs without a prescription – russian roulette with a lethal reaction. Students are realizing they don’t need to risk taking black market drugs to get ahead in school. "I had a prescription for Adderral® for 3 years. I just dropped it and take GungHo now,” says Simon Wright, college senior. “While it's not a drug, it gives me the same feeling of calm focus without jitteriness and I feel no crash. Plus I don't feel the pressure in the back of my head or jaw tension that I had on Adderral®." Read the white paper or purchase GungHo exclusively online at http://www.GoGungHo.com. GungHo is an energy shot for the brain. It was launched by Go GungHo, Inc. out of Salt Lake City, UT in early 2012. 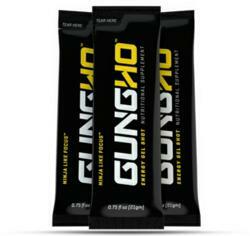 More than simple alertness, GungHo’s proprietary blend of ingredients are proven to increase focus, concentration, memory storage, and memory recall, while typically avoiding the harsh rush, jitters, and crash common with other energy products.